Today we launched our 12th accelerator programme and are excited to introduce you to the nine teams joining us to learn, collaborate and become part of our community! 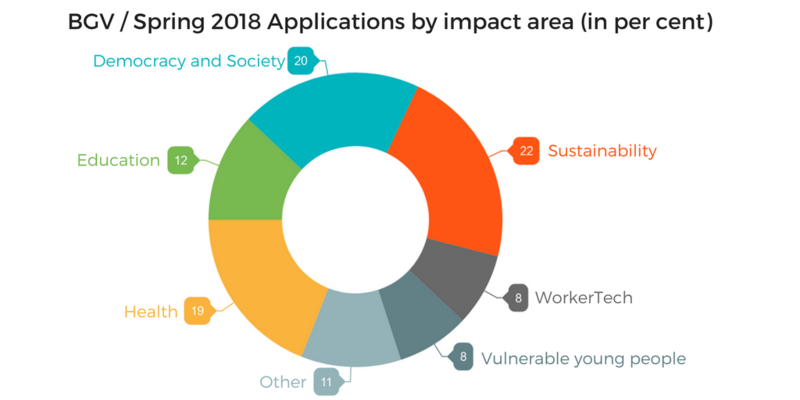 We selected these nine startups out of 180 applications and we’re pleased to see an increase of applications in all our impact areas. All nine teams use technology to tackle social and environmental challenges – ranging from building mobile sensor networks to reduce air pollution, to using VR to teach young people about mental health, to building the infrastructure for consumer data protection, and more. Apiary Book is a mobile app that allows beekeepers to record everything they need to know about their hives. Chanua Health have created Neuro Champions, an AR and VR game to teach young people about the brain and mental health. Chanua Health has been selected to work with our partner The Children’s Society. GearBuddy makes equipment use safer, efficient and more productive across the construction industry through IoT and data. GetMappd is a platform for citizens to manage their personal data and exercise their rights. Pillar is a digital support group in your pocket, designed to support mums. Syrona is a low-cost digital home kit for monitoring gynecological health. The Nu. Wardrobe is an online sustainable community for sharing clothes to reduce waste. WageCheck is an app for workers to track their hours and wages to ensure they are being paid the correct amount. WageCheck won our Future of Fair Work Challenge in February and is supported by our partner Resolution Trust. We’re excited to see how we and our community can support the nine teams during the programme, so if you’d like to get involved or know someone our teams should meet, then drop us a line.